April 12, 2019 – Stocks finished this week not far from where they ended last week. Earnings from JP Morgan (JPM) and Wells Fargo (WFC) before the bell Friday morning contributed to early enthusiasm. A warning from Wells Fargo about lower net-profit margins in the future put the stage coach in reverse, erasing an early rally, while JPM held on to it’s gains. It is hard to extrapolate much about earnings season from the first two reports, particularly given the disparate outcomes. One definite is that it will provide something else to write about in this space, outside of our recent themes of trade and Brexit. Brexit has been delayed again, this time until Oct 31. The new date, which both seems fitting and provides an easy Halloween costume idea gives the Brits six months to try to work out a plan they can agree on. While there are a lot of fine points to work out, the Irish border is the biggest issue. Ireland is remaining in the EU, and so both citizens and goods from the EU will be able to move freely between Ireland and the rest of the continent. Of course, the border between Ireland and Northern Ireland (which is part of Britain) is also effectively invisible under the terms of the 1998 Good Friday Agreement. Erecting a border between the EU and Britain, without putting a border between Ireland and Northern Ireland is the biggest challenge faced by the Brexiteers. Given how far apart the side remain after two years, we’re not convinced this six-month extension will result in a deal, but we’ll happily take a break from having Brexit as an area of immediate concern. Trade remains a news driver. It is becoming increasingly clear that we are not going to get a trade deal with China that dramatically reshapes the relationship between the two countries. The deal seems destined to take the shape of an executive agreement, meaning Congress won’t be asked to approve it and it won’t represent a change to U.S. law. There is virtually no chance that China would agree to make any significant changes to trade or other policies in exchange for basically no commitment from the U.S. Given that President Trump threatened to levy tariffs on automobiles imported from Mexico which would be a direct violation of a deal he agreed to as part of the negotiations that lead to the USMCA, we can’t imagine China making sweeping concessions based on promises from the president. Experts seem to believe that China is likely going to agree to buy more soybeans, and possibly other agricultural goods from the U.S. That is likely to be the biggest tangible outcome of a deal. The administration hasn’t yet publicly said whether or not tariffs on Chinese goods would be reduced to pre-Trump levels, but it seems like China would require some concessions from the U.S. before it agrees to do anything at all. Europe is potentially another front in the trade war. This week the U.S. announced tariffs on $11 billion in goods imported from Europe as part of a years-long dispute about subsidies Europe pays to Airbus. The E.U. contends that the U.S. effectively subsidizes Boeing (BA), but the U.S. disagrees. Trump is also weighing tariffs on imported automobiles, which would hit Europe particularly hard, and likely spark retaliation. Next week brings earnings from a bunch of big-name companies, so we’re optimistic about a chance to talk about that instead of politics next week. All told this week, the S&P rose 0.45%, the Nadsaq added 0.57%, and the Dow Jones lost 0.05%. The S&P 500 continued to make progress this week, using its 8-day moving average (red line) for support after pulling back Tuesday. 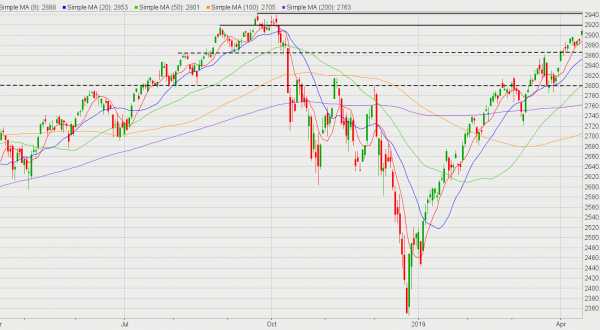 After gapping up Friday, the S&P is near the last remaining levels of resistance (solid lines) around 2,920 and 2,940. New record highs are well within reach in the near future. Should the S&P pull back, it will find support in its 8 and 20-day moving averages, as well as technical support (dotted line) around 2,870. Like the S&P and the Dow Jones, the Nasdaq is within striking distance of new record highs. The Nasdaq has many levels of support below it, with most levels of technical support converging with the index’s moving averages. 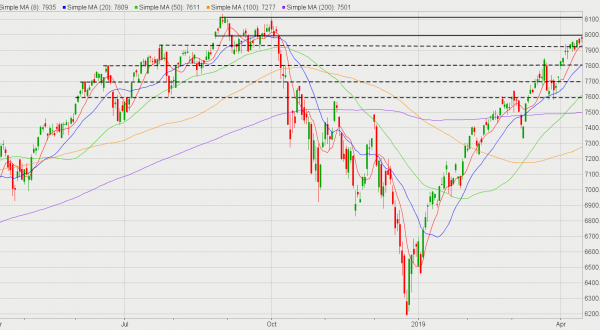 The last of the major remaining hurdles will be technical resistance at 8,000 and resistance just above 8,100. The Dow was hindered by resistance at 26,400 after bouncing from support around 26,200. If the Dow can find the strength to power through the 26,400 level, the next level of major technical resistance will be around 26,800, and then again at the old record high. The Dow has plenty of levels of close technical support, as well as support from its moving averages. 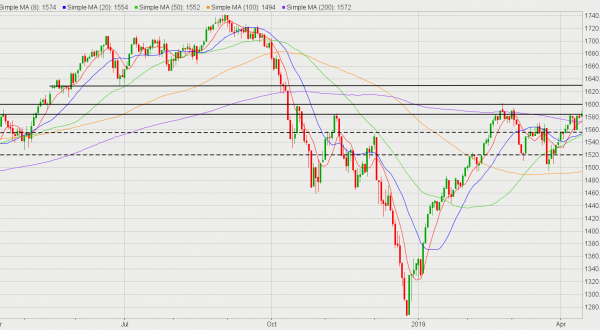 The Russell 2000 has had difficulty with resistance just above 1,580 and has been testing that level for over a week. 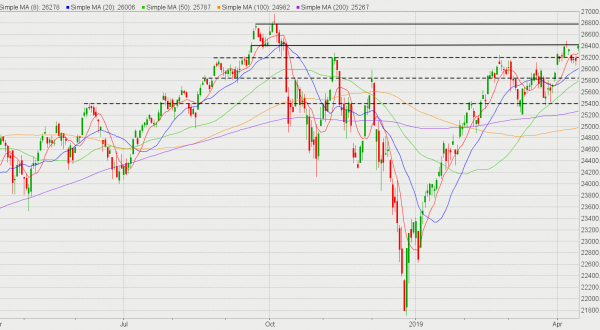 Luckily, it has gained back levels of technical support, with its 8, 20, 50, and 200-day moving averages all converging near 1,560 and 1,580. This tight grouping of support could give the Russell the strength needed to finally break though the 1,580 level. If the Russell can then break 1,600, the levels of resistance will become weaker and further spaced apart, allowing the index some running room. Bobby Raines is the Managing Editor of the Market Intelligence Center. He has degrees in Mass Communications and History from Emory & Henry College. 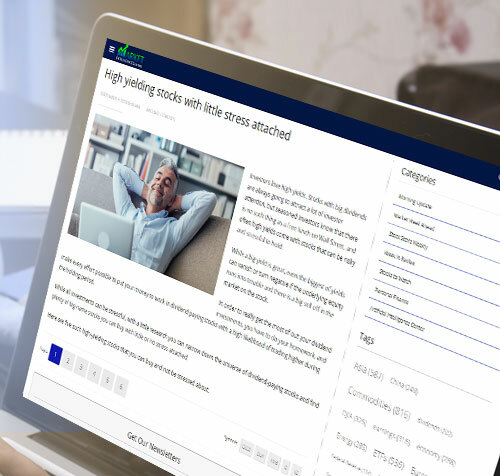 Bobby worked at a mid-sized daily newspaper before making a switch to covering the financial industry full time in the years leading up to the financial crisis. He has been a member of the Fresh Brewed Media team since 2011 and has served as a writer and analyst. You can write to him at braines@marketintelligencecenter.com or follow him on Twitter: @BRatMICenter.